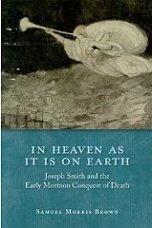 John Taylor, in the canonized eulogy, brought the blood of the Mormon martyrs through each of the rhetorical phases, ending with the Apocalypse. their innocent blood on the floor of Carthage jail is a broad seal affixed to “Mormonism” that cannot be rejected by any court on earth, and their innocent blood on the escutcheon of the State of Illinois, with the broken faith of the State as pledged by the governor, is a witness to the truth of the everlasting gospel that all the world cannot impeach; and their innocent blood on the banner of liberty, and on the magna charta of the United States, is an ambassador for the religion of Jesus Christ, that will touch the hearts of honest men among all nations; and their innocent blood, with the innocent blood of all the martyrs under the altar that John saw, will cry unto the Lord of Hosts till he avenges that blood on the earth. be faithful in clearing my garments of the blood of Gentile & Jew” in order to “do honour to the HOLY Priesthood & the Annointing.